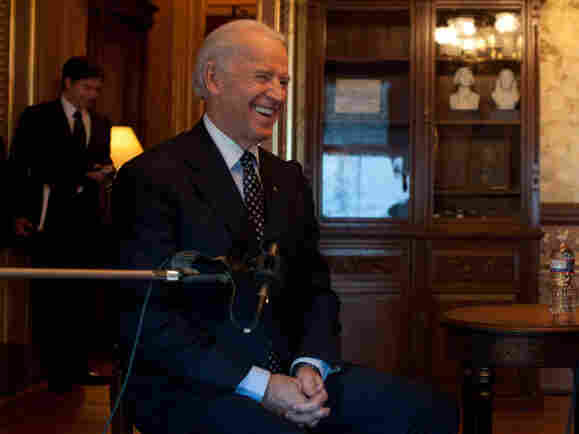 Vice President Joe Biden is interviewed by NPR's Robert Siegel in the Secretary of War Suite of the Eisenhower Executive Office Building, Dec. 13. Saying that the U.S. is not looking for Iraq to be an ally, Vice President Biden told NPR's Robert Siegel this afternoon that the U.S. now views that country as a partner. "We're looking for a stable, democratic government that is not beholden to anyone in the region and is able to be secure within its own borders and have its own policy ," he said during an interview in Washington's Eisenhower Executive Office Building, adjacent to the White House. "To be an ally is [to have] a formal military alliance," Biden added. "We are partners with other countries all across the world." Iraq, he said, will "be a partner." Biden, President Obama, Iraqi Prime Minister Nouri al-Maliki and other leaders have this week been marking the departure of U.S. troops from Iraq. All American combat forces are due to be out of the country by the end of this month — nearly nine years after the start of the war there. Asked about whether the war was worth the billions of dollars spent and thousands of lives lost, Biden echoed a line that the president used Monday, saying "history's going to be the only judge of that." He said it's wrong to assume that Iraq will now be overly influenced by Iran just because the two nations are both majority Shiite Muslim. "They are Persians [in Iran] and Arabs [in Iraq]," Biden said. "The fact they share a religion ... does not mean that they are close. ... It doesn't work that way." As for any lessons learned from the war, Biden said one is that "when you go into a country that is under a dictatorship, no matter what the underlying make-up of the country is ... it takes an awful long time to be able to help establish a circumstance where there's a possibility of a democratic country emerging." He also downplayed talk that the U.S. effort in Iraq in any way sparked this year's "Arab Spring" movement. "The Arab Spring is a consequence ... of the passage of time and history and the exposure of that part of the world" to the rest of the globe, Biden said. More from Robert's conversation with the vice president will be on today's broadcast of All Things Considered. Click here to find an NPR station that broadcasts or streams the show. Later, we'll add the as-aired conversation to the top of this post.